So as bad as you thought things got in our last installment on Bringing up Bella, it was about to get worse. Much worse. We've done a lot right in our time with Bella. Today you have the opportunity to learn from what we did wrong. Really. No excuses. No defense. And no, you don't have to try and make me feel better by saying we did what we could. We screwed up. We didn't see that this was the beginning of something far more serious. And someone got hurt. The first time Bella lunged at Jan, we were startled. I was sick in bed, Bella was on the bed with me, Jan was approaching the bed. Bella jumped down growling and snapping at Jan. I was alarmed and jumped off the bed to move between them. But really, we rationalized her behavior. We "understood" why she was "protective" of me. We "knew" she had been traumatized. We "got" her but we didn't acknowledge our own complicity. While we may not have taken these outbursts quite as seriously as we should have, I did set about doing research to figure out how to address the problem. One of the things we tried was to have Jan turn his back to her during any "outbursts" and, for a while, this really seemed to work. In fact, I wrote in our behaviorial assessment after she bit him that her guarding behavior was reduced to almost nothing over time. Yes, you read that right - "our behaviorial assessment after she bit him". Even though we felt we had gotten her guarding under control, on August 9th, 2011, Bella bit Jan. As much as her behavior had been "improving" and we felt we were doing the right things to address the problem, apparently we were wrong. I'm going to quote directly from what I wrote on the "Behavior Fact Sheet" we filled out for her behaviorist to describe the incident since it will be much more accurate than my memory will allow. The first time Bella actually bit Jan, we were in the bedroom. She had been afraid to enter because a fly had been in the room. Jan was sitting in front of her, I was standing somewhere behind. Jan tried lifting her front legs to his shoulders for a hug (she does this on her own as a "trick".) She got nervous and tried to put her feet down but her nail got caught on his shirt at which point she lashed out biting his hand and wrist. She snapped several times, did not bite and hold. We're pretty sure she inhibited her bite but she still broke skin and caused bruising. I managed to separate them and put Bella in the walk-in closet to cool down." That, as you can imagine, got our attention. We realized then that we had no idea what we were doing and needed to get professional help. And not just from a training perspective but in understanding our dog and how to help her. The next day we called her vet and her trainer. By the weekend we had two recommendations for local behaviorists, had ruled out physical injury and were awaiting test results from her blood work. Reading that assessment now, I can see all sorts of red flags and it's painful to admit how naive and foolish we were at the time. It doesn't help that Jan wears glasses and a beard not to mention has a ridiculously deep voice. We really should have known better. Still, we are "lucky" Bella's bad behavior has been localized to us. It's called "owner-directed aggression" and I'll leave you with this article about it written by Dr. Nicholas Dodman, BVMS, Dipl. ACVB, a professor at Cummings School of Veterinary Medicine at Tufts University and founder and director of Tufts’ Animal Behavior Clinic. 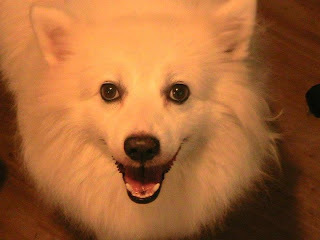 The second dog to enter my life, Fritz, was a cute and clever little guy. I'm pretty sure he was my Dad's ♥ dog. When I was in bands, we used to joke that the best way to get people to come see a show was to name the band "Free Beer!!!" The idea being that when the club announced who was playing that weekend, the sign outside would read: "Tonight: Free beer!!!" and people would be lined up down the street trying to get in. Hence, the name of today's post. And the real reason I've gathered you all here today, the reason I cheated to try and get your attention is a dog named Hardway. Hardway is an 8-year old American Eskimo/Samoyed mix(?) in need of a new home - soon. Hardway showed up in my inbox a few days ago (not literally) through a friend who is trying to help his former mom find a new home for him. I'm going to hand the blog over to Hardway's former mom for a bit so she can tell his story. "Robert and I were living together in March 2005 when we got the call about Hardway. 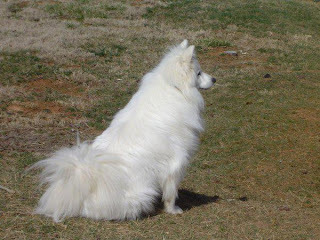 They said there was a "small" Eskie at the shelter in Florence, KY. We drove up there and it turned out that this dog was not exactly small. I think he weighed about 45 pounds when we got him. He was about 1 year old and had been chained to a tree all of his life. The chain was so embedded in the fur around his neck, that the girls at the shelter had to cut his hair to get the chain off him. I was sitting in a chair and he walked up to me, laid his chin on my lap, and looked at me with those big brown Eskie eyes. It was love at first sight. We got all the paperwork done, put him in the backseat, and headed for home... That's when we found out how stubborn and hard-headed he was. Once he got in the front seat, there was no way he was going back into the back seat of the car. Robert said, "He sure does learn things the hard way, doesn't he?" A name was born for the biggest Eskie I've ever seen. His name has been Hardway ever since that day. Photo courtesy of Sally Hale. When Robert and I split up, Hardway and Jake went with Robert... Jake passed away from cancer in late June 2011. I thought Robert's heart was going to break. I think Robert would have laid on Jake's grave and died of sorrow if it hadn't been for Hardway. Now Robert is unable to continue taking care of Hardway. I'm unable to take custody of him because the apartments I live in have a two dog limit... It has fallen upon me to find a place for Hardway. Hardway comes with food, toys, and two more doses of Advantage. He comes with a big heart and plenty of love to share. He's been given so much love the last 7+ years that it overflows. Please, does someone have a place for the most beautiful, loving, friendly dog I have ever known and loved? He is my baby, has overcome heartworms, fleas, and the loss of his Daddy. This is breaking his Mommy's heart, but has to be done. Please consider adding him to your home." Cute little guy, isn't he? He has some health issues (allergic to fleas, sore hips when carrying too much extra weight) but is an otherwise happy, healthy, friendly dog just down on his luck. Hardway is located in Tennessee but transport arrangements will be made if at all possible. So folks, does anyone out there have room in their heart and home for Hardway? Do you, or someone you know, work with a spitz or all breed rescue group? Please leave a comment below and I'll make sure Hardway's momma gets the news. Otherwise, maybe you have time today to post Hardway's story to your Facebook wall or Tweet it out to your followers? I know his mom would be very grateful, as would I. And, as always, thank you for listening. Updated (7/25/2012): Thank you so much friends, for getting Hardway's story out there. I understand from the comments below and from Hardway's former owner that there is interest in offering him a home. I will let everyone know what happens when I hear. Updated (7/26/2012): Hardway has a home!!! Now we just have to figure out how to get him there. He will be traveling from Kingsport, TN to Las Vegas, NV if you or anyone you know can take a leg. You can check the route map here: Bring Hardway home! Thanks. Oh, and please, feel free to cross post widely! "It is with sincere regret that Pawalla is no longer operating as a subscription service." We will let you know if/when we learn more. Welcome to our first review here on Bringing up Bella. Pawalla is a new monthly service that promises to bring "monthly deliveries of new tastes, treats, toys and joy!" for your dog or cat right to your door for about $26 (or less). Given Bella's 'issues', and the fact that she takes medication to help care for those issues, I've been pretty fussy about what I agree to regarding review offers that find their way into our mailbox. But Bella's even fussier than I am when it comes to treats and food. That's right, the dog who eats slugs, compost and even more unsightly unmentionables has the nerve to turn her nose up at such banal treats as Milk Bone dog biscuits. I kid you not. So when the nice people at Pawalla offered us a trial package of their new service to review, I felt obligated to explain to them that Bella might not like their offerings. My assumption was that the products they would provide for that $26/month would be somewhere in the neighborhood of grocery store quality. Luckily they didn't let the little princess' attitude (nor my ignorance) dissuade them from their offer and, after asking a few questions about Bella (mainly age and weight), they put a package together for her and sent it out. Delivery was quick - just a few days from order to receipt. And the packaging was excellent - a sturdy box with several compartments holding the various items safely in place. There was even a personalized note inside hoping Bella enjoyed her box of goodies. They also include a write up about the different products included in the package. I also went out and priced each item to see what the package would cost were I to purchase it separately at retail. The retail item total came to about $60. Pawalla offers their service for $26 for a month to month subscription and discounts that price further if you sign up for an annual subscription. I am curious as to how they will maintain the quality of the products they provide as well as how many people will really take advantage of it. It's a great deal if they can maintain such quality. Although I'm not sure Bella needs a new toy every month, it might make for a nice local shelter donation here and there. Overall, if you find yourself in a position to treat your dog to a box full of high quality treats and food, I would definitely recommend taking a look at Pawalla. Bella and I give them two thumbs and four paws way up. This just in: Use coupon code 'Bella' and save 20% on your first box! Thanks, Pawalla! After last week's cliff-hanger, I knew I couldn't keep people waiting too long to learn why Bella's constant company after I broke my arm last year turned out to be not quite as cute as we initially thought. This is not, however, a post I have relished writing. Mistakes were made and bad behavior happened. But lessons were learned and that's why we're here now anyway - so that maybe others can learn from our mistakes. I also hope to encourage people not to give up on their dogs if they start to have problems and to seek help (sooner than we did) when needed. Because, for as bad as it's about to get in Bella's story here on the blog, in "real life" we are living on the other side of it all with a really wonderful, more confident and much calmer dog. She may not be perfect but she's still our little girl and we will never give up on her. So what could possibly be wrong about Bella not leaving my side after I broke my arm? Bella, our insecure and fearful dog, wakes up happy in her nice comfy bed that Mommy bought her when she first came to live here. "Here" is a warm house with a big yard where she is protected from the scary thunderstorms and Daddy is always home to make sure nothing bad happens. Hmm, except today. Where are you going Dad? Today Daddy went somewhere and left Bella and Mommy alone. And then BANG! something happened to Mommy! Something bad. Something Bella couldn't fix with her kisses and play-bows. And then something even WORSE! happened - some really scary stranger came into Bella's house and took Mommy away. But it's Bella's job to keep Mommy safe. I'll be a good dog. Do dogs feel loyalty and love or are those traits really just a display of their own self-preservation? Did Bella stay by my side because she knew I was hurt and wanted to comfort me or because she saw me as her key to the warm and wonderful life she's come to have and wanted to defend? What did run through her head in those hours she was left alone after her "rescuer" was injured and taken away? Did she think we were never coming back? Did she think she was trapped? Did she think she think she failed me? Whatever she thought, Bella was obviously traumatized by the event in ways we didn't immediately recognize. It wasn't until she lunged at Jan when he tried to approach the bed that we began to understand. You read that right: Bella attacked Jan. She didn't connect - this time. But she did bark and growl and lunge at him. It was terrifying. Over the next several Mondays, I'll go in to some of the details of the events, how we tried to address the situation, when things went from bad to worse and what we've learned in the process. It's been a long haul and we made a lot of mistakes. But we also got help - from a variety of sources. We'll talk about all of that and finally, finally bring her story to where we are today: succeeding in her agility class for reactive dogs, much more comfortable in her own skin, living a happy, almost downright normal dog life. So stick with me through the rough spots ahead and we'll celebrate her wins on the other side. There have been some difficult times and I have to give my husband all the credit in the world for not walking out on us or giving up on Bella. Jan has probably learned more about dog behavior and communication than he ever wanted to know. He reads the blog (and is our silent partner) so I just wanted to say "Thank you." I do adore you. 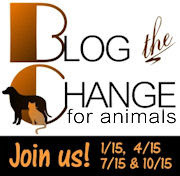 Today is Be the Change 4 Animals' quarterly "Blog the Change" event and this quarter the goal is to make bloggers (and blog readers) aware of the upcoming "Bloggers Unite for Dog Rescue" global event addressing the importance of dog adoption. It took me a few reads to make sure I understood what's going on here today - I'm writing a post today to tell people they should join me in writing a post next week to talk about how important it is to adopt your next dog? Okay, I think I get it - takes me a few tries sometimes. But actually, I do get it and here's why. Back in June when Pedigree Foundation was running its "Write a Post, Help a Dog campaign, I found out about it on the very last day of the campaign. A few of my readers mentioned they knew nothing about it either. So today, BtC4A is giving everyone a week's notice for the "Bloggers Unite" event by getting bloggers to tell other bloggers about next week's campaign. Very cool. Have a blog? Awesome! Write a post about a rescue or shelter in your area or any dog rescue-related topic that interests you. You DON'T have to be a pet blogger to participate. 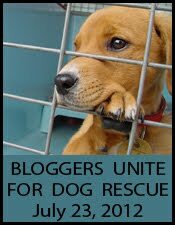 In fact, that's the whole point: we want to get every blogger to write a post so everyone who reads blogs of all kinds will see these posts and learn why dog adoption is so very important. The goal is to reach as many people as possible about the importance of dog adoption. But just why is dog adoption so important? "Millions of dogs are euthanized" every year "because not enough people are adopting dogs through local rescue groups and shelters." Many people still buy dogs at pet stores (or worse - online!) even though most pet store dogs come from puppy mills. We here in the pet-blogging and animal welfare community know most of this already but so many people outside our circle remain uninformed. And since pet stores often go out of their way to misrepresent the facts and confuse the consumer about where their puppies come from, even people who want to do the right thing may not realize the dog they are buying comes from a puppy mill. It's our job, our responsibility, to get the facts out there so everyone knows. 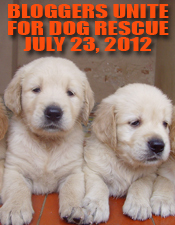 So pick a topic about dog rescue and join us next week to tell the world how to save a life by adopting their next dog. Thank you Cokie for re-inviting me to join your wonderful Thankful Thursday blog-hop. It's an important reminder that we have so much for which to be thankful. And I understand the hop is supposed to be a hopeful place where we speak of what is good and beautiful in our lives and I will get there, honest. But please indulge me a moment first because I really feel I have to say something about the events of the last day or two in the animal welfare community. Specifically about Lennox, the American Bulldog - Labrador Retriever mix who was recently killed in Belfast, Ireland. I'm not going to say much (I know, that'd be a first, right?) but my anger is deep and my fear, palpable. My sister has a Bullmastiff. My friends have Pit Bulls, German Shepherds and Rottweilers. Bella's breed cannot be documented. And what we've learned through the debacle in Belfast is that anyone can claim a dog looks dangerous and that dog can be taken away and killed despite all evidence to the contrary, despite world-wide outcry, despite reasonable offers to provide a gracious out for the city council. Just for what it looks like. Breed specific legislation is illogical and irresponsible. It is hurtful and cruel. It is also proven to be ineffective. I weep for Lennox, for his family, for his little girl and for all the dogs killed in the name of ignorance. And yet I am also thankful. Thankful for the hundred thousand+ voices raised in protest around the world. Thankful for the efforts of trainers and rescuers and organizers who tried, and keep trying, to help Lennox and dogs just like him. Thankful that maybe now we have gained the attention of people who were previously able to remain comfortably ignorant of the encroaching danger breed specific legislation poses to their own dogs. Thankful for the communities that have learned and grown and rejected BSL. Thankful that maybe now we can effect real change. Rest in peace now, Lennox. Your suffering will not be in vain. If you have a Facebook account, please consider adding your voice to the "I Am Lennox" event as a show of support that every dog could be Lennox. Today, every dog is Lennox. When last we left our little hellion, er, heroine, Bella had just graduated from Ruffians 101 and we were looking into "Agility for Reactive Dogs" classes circa Fall 2010. We were looking forward to it but were waiting to get through the holidays before beginning this new journey. But before we get to that, we need to take a little detour. Bear with me as this does have relevance down the road. I'm never gonna get to agility class, am I? I think I've mentioned here or there that Bella's mom isn't really the most graceful creature on the planet (read: she's a down-right klutz most of the time). And shortly after the holidays when we were just about to sign Bella up for the new class, I had a little coordination altercation. When we got Bella, Jan was unofficially retired and has always taken care of her during the day. Even when he went back to work, he was able to work from home and Bella was seldom without him. Every once in a while, he had to go to the office for a meeting or something but as a rule, he was home. January 11th 2011, was one of those days he had to go in to the office (about an hour away) to meet with some out of town clients and Bella and I were left alone in the house while I finished getting ready for work. After taking my shower, I made the brilliant decision to step on a chair to open the blinds in the bedroom. This chair. "That's the one officer. It just jumped right out and attacked me." While I was standing on the chair, my left ankle buckled and sent me tumbling off said chair. Onto the carpet-covered cement slab that is our bedroom floor. And then I looked down at my arm and changed my mantra suddenly to "Oh don't throw up. Don't throw up. Don't throw up." My arm was bent where arms don't bend. What does this have to do with Bella, you ask? Well, Bella was alone in the house with me when this happened. Bella who is afraid of people. Bella who is already somewhat over-protective of me. Bella who stood by after watching me suffer some rather obvious trauma then watched as my neighbor came in and took me away. And all the while, no Daddy at home to make things better. She was left alone from about 8 am when my neighbor whisked me off to the hospital until about 4:30 pm when Jan was finally able to break away from his clients and get home to her. I returned home around 5:30 and staggered into bed. They gave me some medicine at the hospital that made me horrifically ill and by the following morning, I not only had a broken arm, I had a migraine and was finally giving in to the second half of my mantra to relieving my stomach of what little food I had eaten the day before. For 3 days Bella left my side only to eat, pee and poop. Tune in next time to find out why it wasn't. So, I know for a fact we have our share of walking wounded among us (I'm looking at you, Kim, Kristine, Lauren and Pup Fan... ;) Anyone else want to step forward and share some of their less-than-graceful forays into the Kingdom of Klutz? Photo property of North East All Retriever Rescue. Part of me thinks all I should have to do is post this photo and people will be scrambling over each other in their bid to adopt beautiful Bruno. Part of me knows that's not how it works. So allow me instead, to introduce you to this affectionate, mellow senior softie, Bruno, the black Lab. Bruno is 9-years old and looking for his new forever family. He's currently living in foster care through North East All Retriever Rescue and you can read his whole profile on their website. He used to live with a family that had five children so he's really good with them. He's also very good with other dogs but cats, not so much. He's a bit of a couch potato and maybe a little bit velcro (I think that's part of the breed standard for Labs. ;) And come on, he's gorgeous, isn't he? So, if you find yourself in need of a couch companion, hop on over to NEARR's website and tell them you just can't live without this big, beautiful boy. Or if there's no room at your inn these days, just click one of those social media buttons down at the bottom of the page and help Bruno out by getting his info in front of more people. The more people who see him, the sooner he finds his once and future forever home. Thanks! And have a wonderful weekend. Happy 4th of July, folks. Previously on Bringing up Bella, Bella's mom was whining over her "Terrible, Horrible, No Good, Very Bad" year. 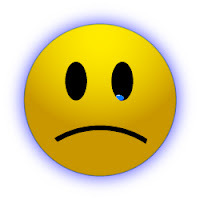 It wasn't really meant to be a pity party or even to suggest that I thought I was a horrible mom for missing something going on in Bella's life, although in retrospect, that is how it sounded. It was really just an attempt to begin to identify Bella as a "Highly Sensitive" dog and our realization that there was a dimension to her education that we weren't even aware we needed to address. 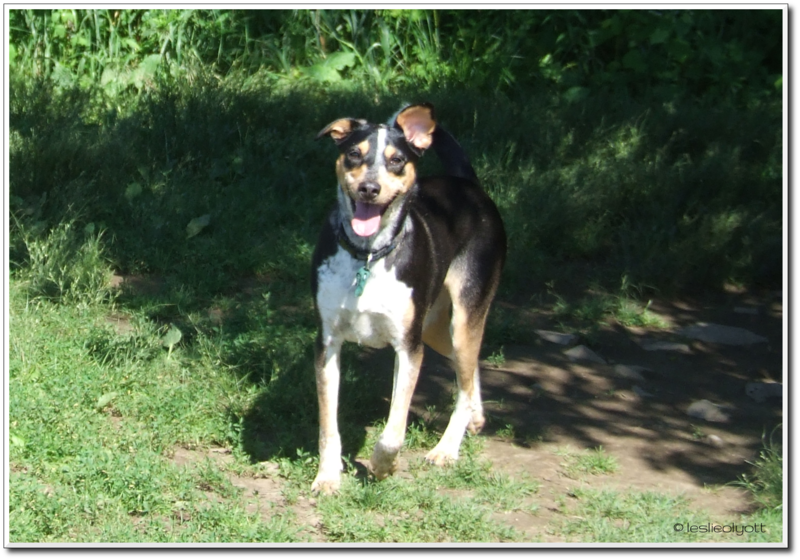 We knew she lacked socialization as a puppy and we had tried to set up appropriate meetings/play dates/group play. What we didn't understand adequately at the time was her deep-seated fear of losing the comfort and safety she had found with us. And more specifically, how she saw me as the single point of failure for that potential loss. Bella has from the very first been somewhat possessive of me. We noticed it on our first meeting at the shelter when she was on my lap and another dog began to come over to me. She snarked. She wasn't even my dog yet but she didn't want this other dog to take away my attention that she so obviously relished. When we brought her home with us and as we began to introduce her to other dogs, we were mindful of this 'over-protective-ness'. We made a point of having me less involved in the meet and greets as Bella would be worried and defensive about the other dog getting too close to me. And we worked on it at the dog park where I could move closer to other dogs while she was too busy playing to care if I patted a pal on the head. However, after Bella's little dust-up with Maggie, we realized we needed to address this behavior in a more structured way. (Read: we were in over our heads and didn't know how to fix this.) And so began our first venture into reactive dogs training. We are very fortunate to have a number of trainers in our area. One place barely 5 minutes away offers a number of different classes for a whole variety of 'issues', skills and levels. It's a big place that can easily hold 6 - 8 reactive dogs without the dogs having to be too close to each other. There are fences with sheets draped over them so the dogs can't see each other except deliberately during exercises. Who are you calling a ruffian?! The Douglas Adams' fan in me couldn't help but chuckle when we were also instructed to "always carry a towel". Seriously. It is to become the dog's "mat" and "safe space" during class and, subsequently, at home and abroad. Unfortunately, there are all levels of trainers in the world and some work better for some dogs and people than others. The person running our class was well-versed in clicker/positive reinforcement training but obviously had little experience with actual scared-y dogs. In one session where Bella spooked because of the banging/booming of the garage doors, we were told to "get your dog under control". Um, dude, you're the trainer and we're here for you to teach us "how" to get our dog under control, not just tell us to do it. Another entertaining anecdote that made me realize this guy just didn't understand: during an outdoor class one day, Bella and I were waiting for our turn when we were visited by a bee. Trying to get Bella away from said bee, I was reprimanded for causing a distraction for the other dogs. Okay, I get it. We're all working with dogs who have issues here and ideally we want to give each dog in the class the opportunity to be successful with their task at hand. I get that, I do. But I've gotta tell ya, not at the risk of my dog getting stung by a bee that she's already terrified of. Grr. Arg. Anyway, turns out the absolute best part of this 8-week course comes near the very end when the dogs are introduced to a couple of agility obstacles. Everyone in class noted that Bella just 'lit up' when she was running the jumps. Even our less-than-observant trainer said she looked like a different dog and recommended she go on to Agility for Reactive Dogs. Happily discovering he didn't teach it, we began making plans to sign her up. And then I fell off a chair and turned Bella's world on it's head.